On arguably the most difficult of a triptych in the mountains, on the iconic slopes to Lagos de Covadonga, Nairo Quintana took his first victory in the Vuelta and showed he’s the strongest rider in the race. Countering an attack by Alberto Contador whom he later left behind, he moved smoothly into top gear to overhaul Robert Gesink, the last man left standing from the break, who finished second just ahead of a resurgent Chris Froome, initially distanced on the climb. The stage shook up the GC, with the victor resuming rightful ownership of the red leader’s jersey. Choices, choices after such an exciting finish to today’s stage! JumboBee Robert Gesink made a valiant effort to take the stage, Chris Froome rose Lazarus-like from the almost dead, but my rider of the race, Movistarlet Nairo Quintana, was stronger than everyone today. Before the stage started, there were fears that the stage would once again be won by someone from the break. The GC were rumoured to be keeping something in the bank for the third week. The initial pace was high and it took around 60km for the 16-man break to establish. Having kept the Movistar and Etixx-led peloton at bay, the group splintered on the final climb as various riders attacked before Gesink established a workable advantage. The GC riders were all eyeballing one another further down the slope until Sky’s Froome looked to be in difficulty. Tinkoff’s Alberto Contador attacked and Quintana countered. The duo cut through the remnants of the break like a hot knife through butter while Froome kept going backwards. Having exhausted his teammates Froome now improbably started moving back up the hill, eyes glued to his power-metre. Once he reached Alejandro Valverde‘s wheel, the team must have advised Quintana who, with 3km remaining, went into overdrive and simply left Contador behind. 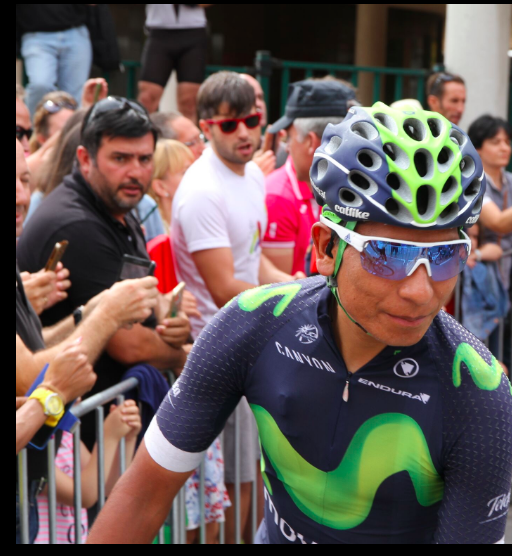 Quintana’s usually smooth pedalling style now betrayed his haste to put as much distance into Froome, and the other GC contenders. He soared past Gesink to finish solo 25 seconds ahead of Froome, recording his first individual stage win in the race – to add to his wins in the other two grand tours – and retaking the leader’s jersey. Let’s hope we can keep this jersey for longer. What I felt and saw today was wonderful. It really makes me confident that I can fight to win this Vuelta. I felt well all day, leaving aside the crash in the beginning. The great work by the whole team was visible today, and made me more motivated to reward them with a win. The riders are going to enjoy the first rest day after 10 days of hard racing. The GC is slowly but surely taking shape but there’s plenty of hard racing still to come.